The probability of a newly hatched cod living to maturity are, approximately, one in one million. 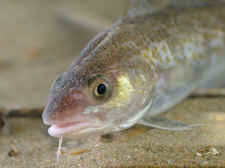 For every million baby cods starting out, one makes it to sexual maturity. This has resulted in catastrophic events. Fishing has focused, obviously, on the largest fish...these are the ones who do two things: they lay the largest number of eggs, and they have laid the most eggs during their respective lives. By removing them, you remove the biggest source of more cod, or you remove the most productive producers of those baby cod, of which you need a million (more or less and on average) to get one who will continue the species. But, they also produce the biggest profit per unit of effort. This has not only resulted in fewer and fewer and eventually pretty well no large (old) female cod, but it has also favoured the survival of cod who start laying eggs at a younger than average age. That is to say, if you are a younger (smaller) cod, you are more likely to survive the risk of being caught by human fishers, although you lay fewer eggs. BUT, if you lay eggs at an age younger (smaller) than average, you are more likely than a more typical older fish to pass that trait on to the next generation than if you start laying eggs at an older (bigger) age, by which time you are, statistically speaking, more likely to have been caught and killed. Thus you produce "cohorts" of young (small) cod laying eggs at a younger (smaller) age, albeit fewer of them because you are not as big as the now missing old (big) cod. From the standpoint of the fisher, there looks like there is still lots of cod...all those young (smaller) ones. So you shift your attention to them because that is how you earn your living. If politician, following the advice of scientists, tries to legislate against that, you vote him or her out of office because you want that money, and so politicians learn to ignore their own scientists. You find that by making net size smaller, and finding a market for the young (small) cod, you actually catch MORE cod, and earn more money. And that is exactly what led to the great cod collapse from which northwest Atlantic fisheries have never recovered. Just before the collapse of that population there was a spike in the number of cod caught, followed by a very abrupt collapse...call it the death spike. There had been warnings by both scientists and more astute fishers for years and years, but it was all ignored in the interest of greed...short term return. One in a million does not represent good odds. But it makes egg laying all the more important for species survival, so the thing that was done, killing off the biggest egg producers, was ecologically and commercially catastrophic.